Incredible sunset on the Devil's Racetrack. 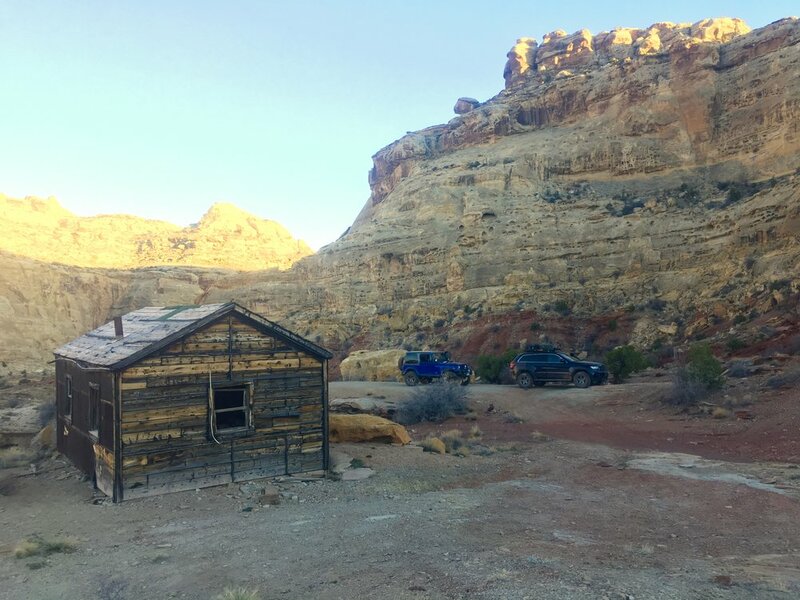 The San Rafael Swell of Utah is rife with importance and sentimental blackmail for me personally, and I was hoping that Greer would be inundated with the place as well. 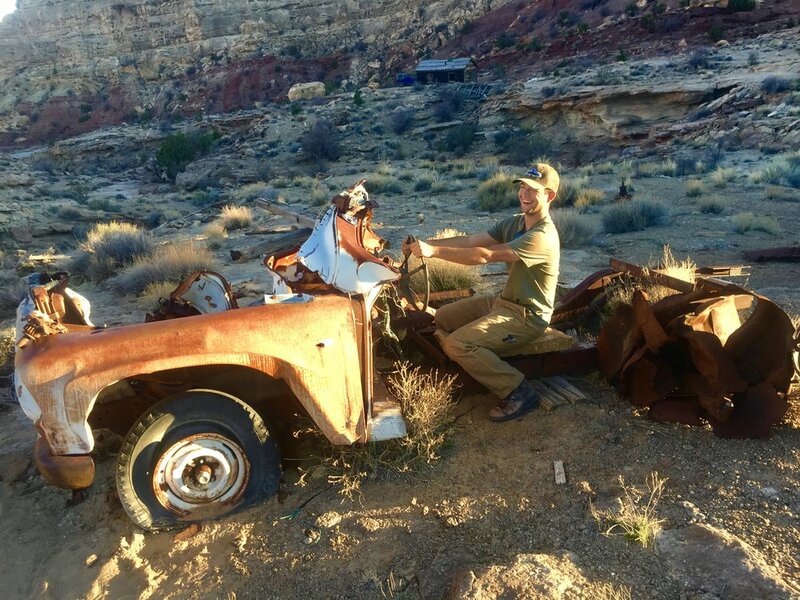 Greer has had experience backpacking in the Rockies and various outdoor adventures, but this would be his first time in the desert overlanding and learning some technical trail driving skills. One of the best entry points for this on the Swell is Black Dragon canyon with its pictograms and canyon bottom trail. 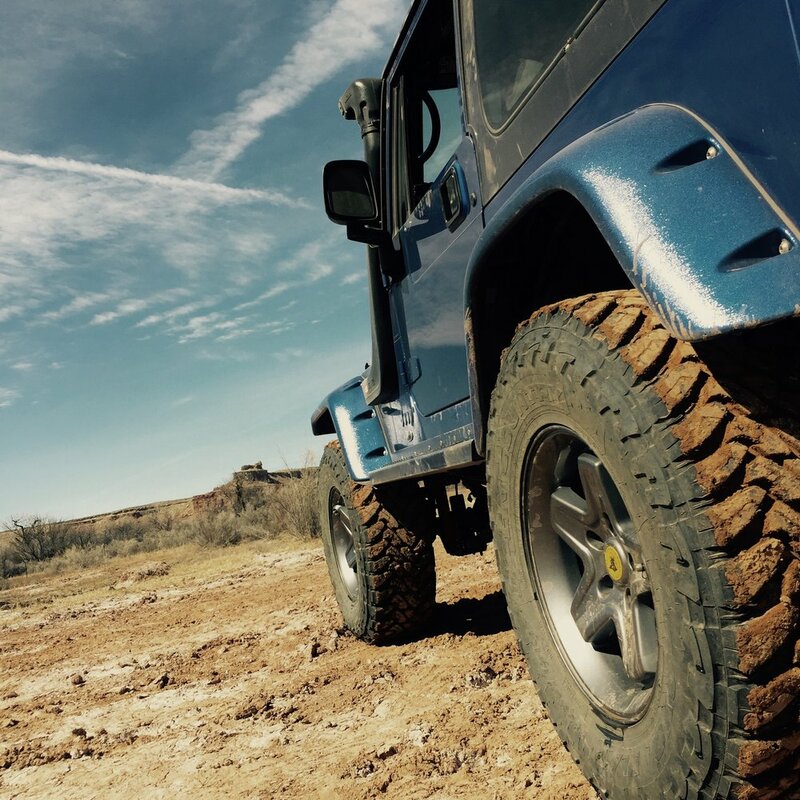 We set out in March with perfect weather and the two very well equipped Flatwater Overland Jeeps. We began this journey with only a basic travel plan and a fluid schedule in order to be flexible for weather events this time of year. I also wanted to explore some of the southern areas of the Swell that had eluded me in the past. The weather continued to be simply amazing for the duration of the adventure, and we were able to tackle some very technical trails in this BLM wonderland. “I must admit that I was nervous about this trip, in the way one gets nervous before riding a rollercoaster. The closest to off roading I had done was getting both my truck and a friend’s jeep stuck in a Florida bog, and Matt was talking about having me pull a trailer though the Utah backcountry with Big Blue. All those nerves went away when I bumped the back tires up over my first big ledge, instantly hooked on the technical aspects of off-road driving. Matt may have gotten me too excited about the driving part of overland exploring, because I think he started to get fed up with my constant attempts to route plan towards the hardest trails I could find on the map. We arrived late morning at the mouth of Black Dragon Canyon and began the trek up the deep canyon. The Black Dragon pictogram on the north wall is what gives this canyon its name. It looks very similar to a pterodactyl, and makes the whole scene mysterious. This and hundreds of other rock art sites in the Swell from multiple ancient cultures impart unshakable thoughts about exactly what the inspiration was for the images. There many pictograms and glyphs in the immediate surroundings that can be a little shocking if you have never seen ancient rock art in person before. We spent some time scrambling on rocks to get a closer look before heading up into the Swell. The Black Dragon Canyon trail is ever changing with each weather event. It is never the same twice. 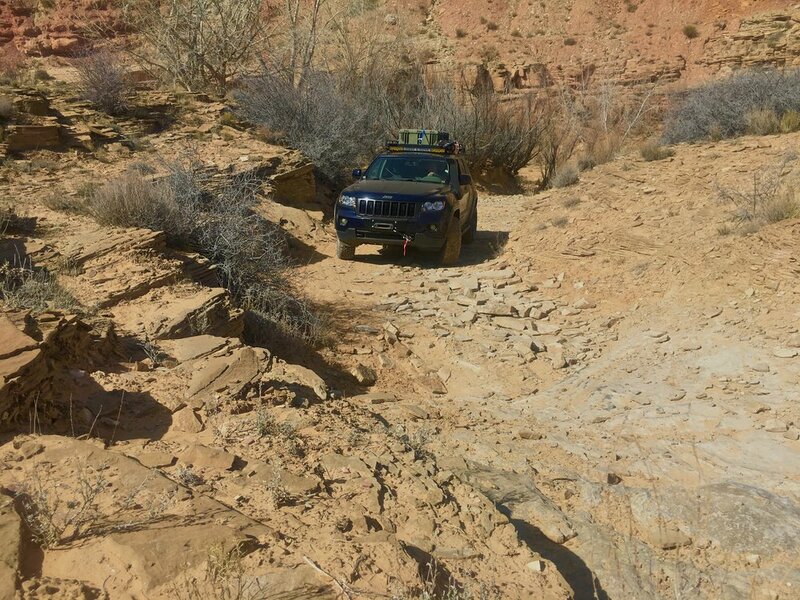 The trail in the lower canyon is often washed out, requiring some technical rock crawling through the wash itself. Expectedly, it was the case this time around as well. 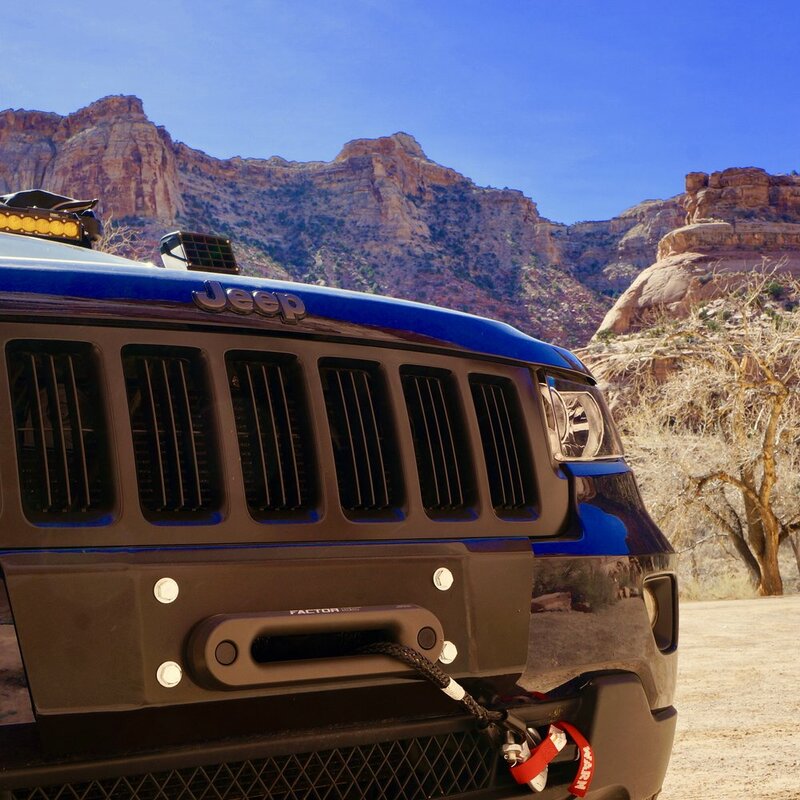 Greer got to cut his teeth on some good introductory technical trail driving. It wasn't long and he was picking the more difficult line on the obstacles. Pretty much any trail you pick on the Swell is going to have some spectacular scenery and vistas. We stopped multiple times to climb a hill or just peer off into a canyon. Topography like this can be difficult to take in. The canyons and sky can overwhelm your senses until you can just stop to orient yourself in the wonder. 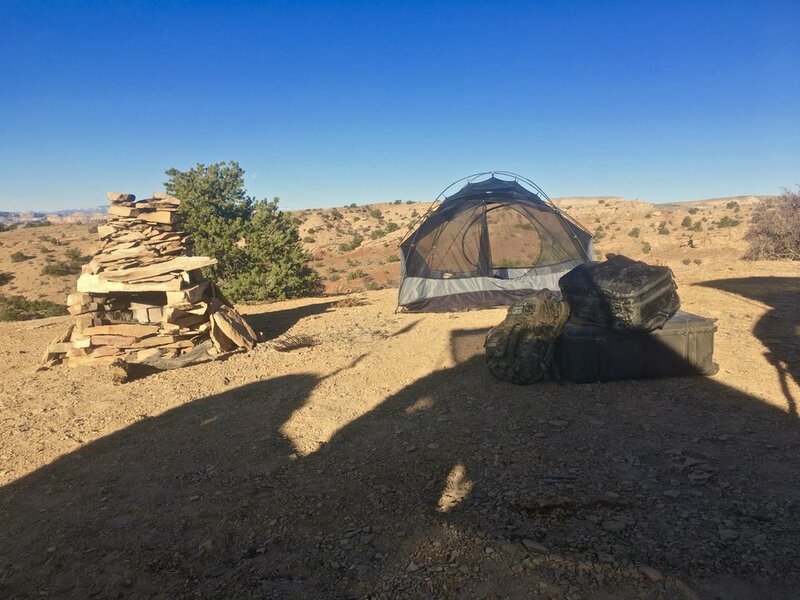 To wind out the day, we continued up to the Jackass Benches area and over to The Wickiup where we eventually dropped down into Oil Well Flat and made camp for the night. We woke up pretty early on Day 2 even though curious cows had woke us and the wolfdog in the middle of the night. The spectacular iconic vistas all around Oil Well Flat are straight out of an old western movie. The goal was to reach and complete the Devil's Racetrack, but we were taking a roundabout way in order to see some more pictograms. The shortcut would have been to cross "Fix-it" pass and head straight to the Devil's Ractrack, but we got to cross a lot of open country instead and see some ancient rock art. After breaking camp on Oil Well Flat, we headed to Buckhorn Wash to check out some pictograms and a dinosaur footprint. 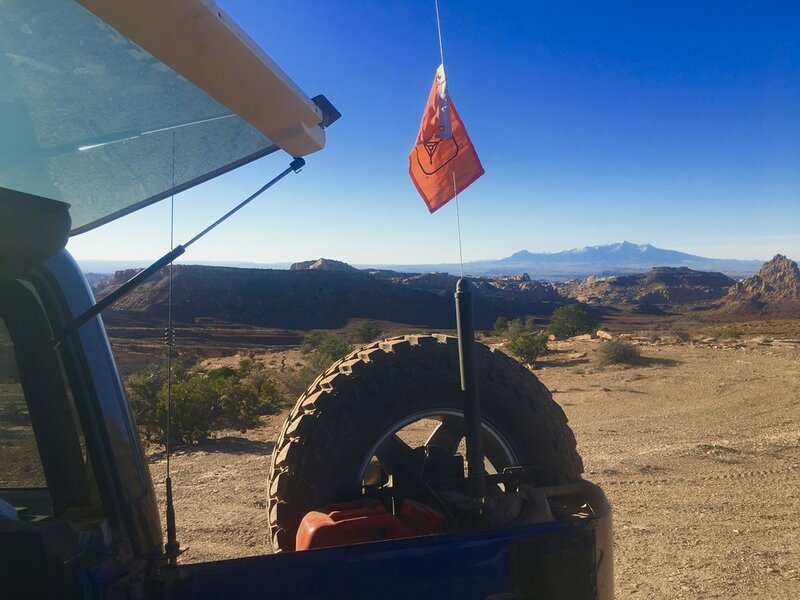 We continued on to Fuller Bottom and the San Rafael river crossing before swinging back east to connect with the Devil's Racetrack trail and our first serious technical terrain sections. 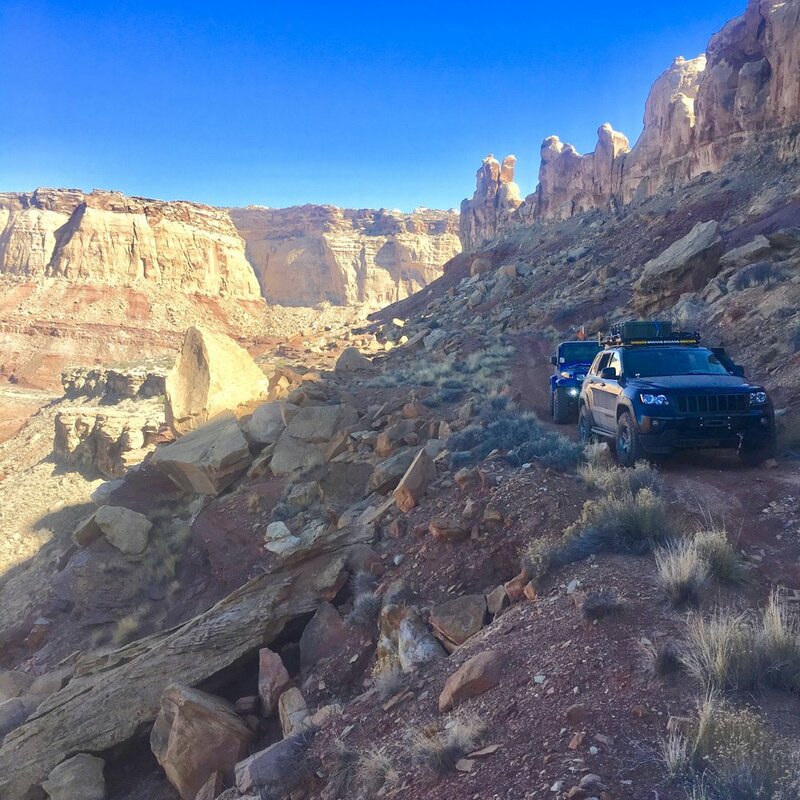 The Devil's Racetrack is one of the premier technical routes in the San Rafael Swell, crossing a wilderness study area. 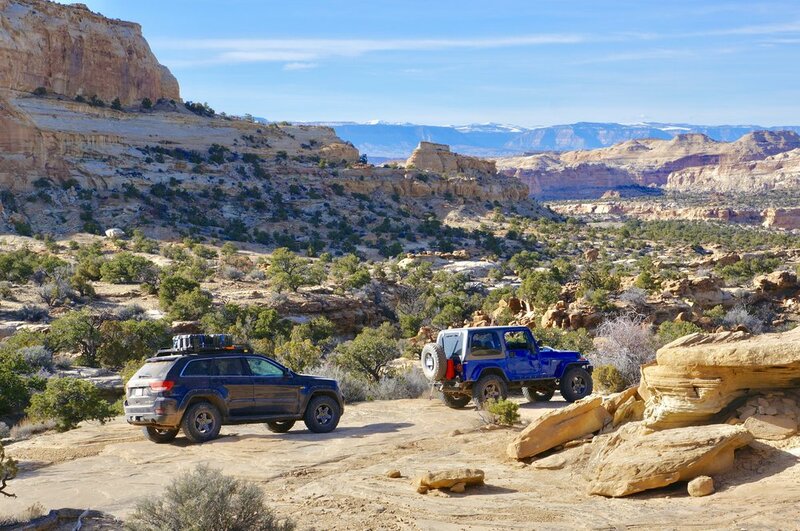 Most of the trail is rather mild with some rock crawling, but the "racetrack" section has large ledges, offset broken slickrock, and a narrow off-camber path between two large drop-offs. Greer was getting confident and tackled this BLM black rated route like a rock star. 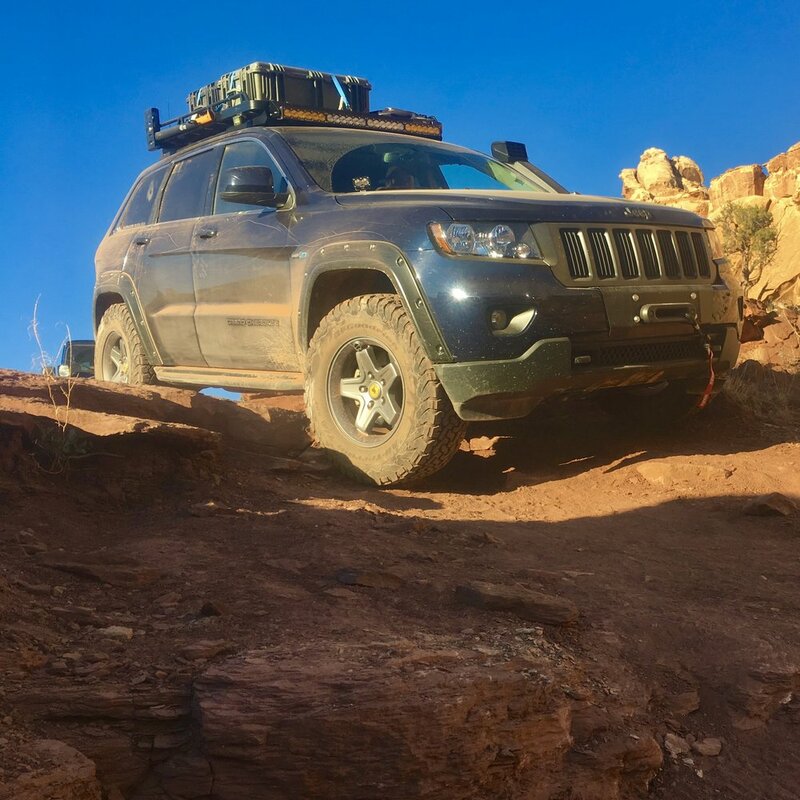 The Grand Cherokee had some challenges, but also successfully tackled some large obstacles with aplomb and no winching required. The sun was setting, and we finished the trail in the dark before settling on a campsite in sight of Ghost Rock on the south side of I-70. Daybreak on the third day in the Swell after camping next to a historical corral in the shadow of some typically amazing sandstone formations brought some delicious coffee and deep conversation. We eventually loaded the rigs back up and decided to head to to the south end of the Swell that I had not yet explored. 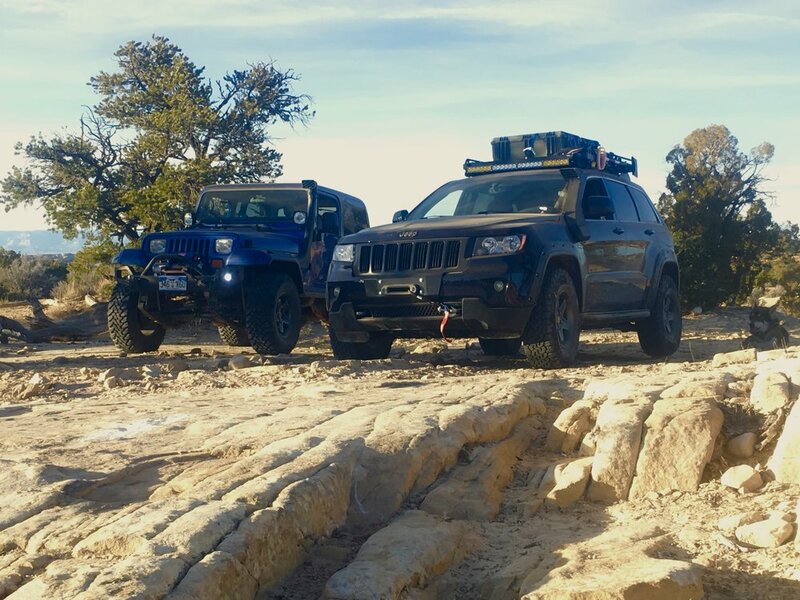 Greer was anticipating some more technical trail driving in the YJ Wrangler, so we picked out the Behind the Reef trail; another BLM "black" route. It eventually turns into an ATV only trail, but still takes travelers deep into the lonely southern reaches. We were in for some breathtaking vistas and fascinating historical ruins along with the desired driving challenges. On day four, it was time to start heading out of this beautiful desert. We found our campsite just past dusk on the top of a ridge with a truly epic view to the south. The weather had been so much better than expected for March. We stayed up late talking and soaking in the Milky Way after making supper in a stacked stone oven we found at the campsite. The air was still and warm that night with distant mountains glinting moonlight off snowy peaks. We tracked blinking satellites arcing across the stars and followed jetliner contrails across our galactic roof. It was a short, but wonderful night's sleep. We procrastinated packing up while drinking in equal parts coffee and sunrise. It was an ambivalent morning with equal parts awe for where we were and disdain for having to leave. Our trail out wound through varying dry washes, canyons, cedar forests, and scrub land trampled by wild horses. 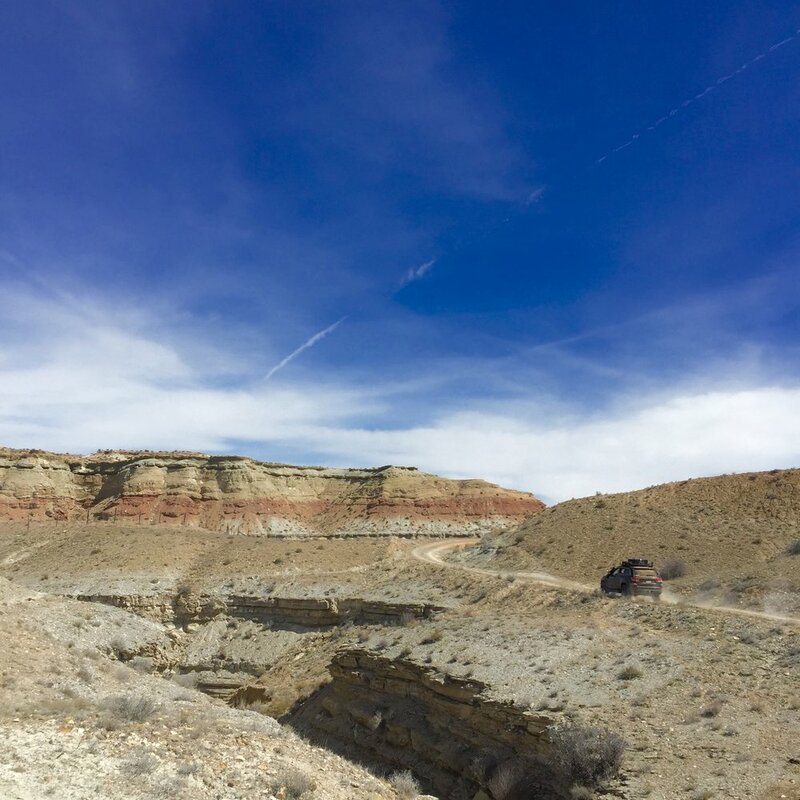 After leaving the San Rafael Swell, we made a pit stop in Sego Canyon to photograph some more rock art and explore the Sego ghost town. Another adventure worthy of reliving.